With only one in 33 leaders in the travel, hospitality and leisure industries in the UK identifying as being from a black, Asian or minority ethnic (Bame) background, as compared to 1 in 8 in the UK population, it’s time to push diversity in the travel industry to the top of the agenda. 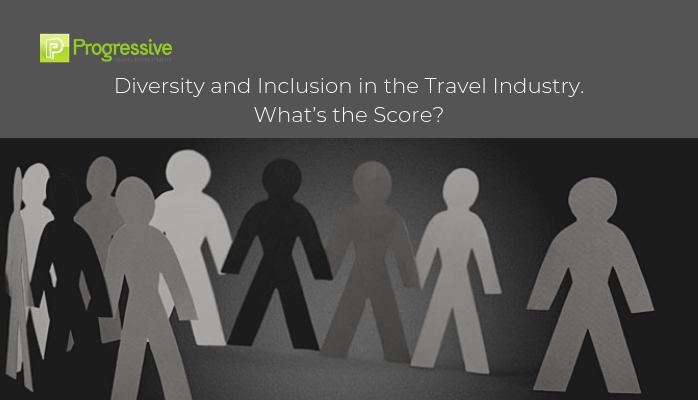 The Travel Trade Gazette (TTG) is attempting to do just that, with a diversity survey of the travel industry and a Diversity and Inclusion in Travel conference on 3 July, where the survey results will be revealed. Dan says, ‘Every business needs to be constantly aware of issues of diversity and inclusion, for their own company culture, and for the proven business impact that comes with embracing these areas. However, we think this has been a particular challenge for travel.’ Dan wants as many leaders in travel as possible to attend the conference and take home real ideas to drive change. Of course, we should always hire based on skills and abilities, but those of us in a position to hire, should encourage our clients to think outside their usual boxes. In another recent blog, the Progressive Team has encouraged people to hire more creatively – this also includes being more ethnically diverse. Natasha says, ‘Some North American companies do specifically target the LGBTQ market in travel product offerings, but if others were to start doing this for ‘black friendly tours’ it would seem very non-PC. We need to think more cleverly.’ We aren’t looking for a segregated travel industry, but a more diverse one. But things are changing. Large companies do still tend to be very white, but start-ups and small independent travel agents are more diverse and slowly changing the face of travel. I do also believe things are gradually getting better. Diversity in the travel industry has to be a corporate culture priority – it starts at the top. Travel leaders must promote greater diversity in their workforce, and that trickles to HR and recruitment practices. Let’s hope companies catch up. Diversity in the travel industry is a pressing issue, and all those in a position to act should do so. To find out more about diversity in the travel industry and sign up to the TTG Diversity and Inclusion in Travel conference on July 3, 2019, click here. Connect with Natasha Sharma on LinkedIn click here. Connect with James Roberts on LinkedIn here.